i love baking. i love booze. it really only makes sense to combine the two. i think it was last st. patrick's day, when i made amazing irish car bomb cupcakes, that i discovered my real talent for making (themed) alcohol infused cupcakes. my second attempt was french toast cupcakes with red wine frosting for greek easter. also a win. the 4th of july is by far one of my favorite holidays. (although there's no topping halloween of course!) 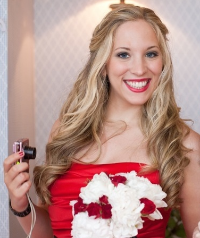 i'm very patriotic, and also i look great in red, white or blue. thanks italian/german genes. 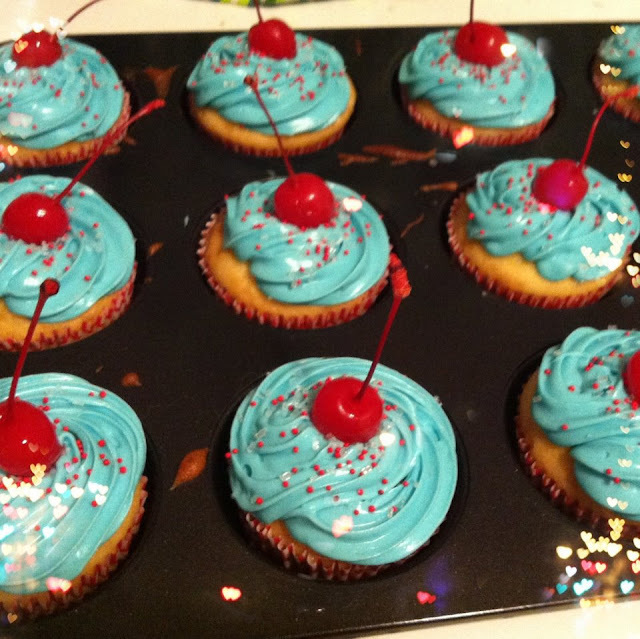 and thus, 4th of july alcohol cupcakes were born. white cake baked with champagne, white chocolate ganache filling with cotton candy vodka, blue cotton candy frosting with cotton candy vodka, red sprinkles, and cherries soaked in bourbon. i started with regular old white cake mix from a box. you're free to make your own cake from scratch, but i'm all about the short cuts. prepare according to box directions, but substitute 3 tbsp water for 3 tbsp champagne - totally optional. obviously, while baking, any sort of alcohol content bakes out. it's more of a flavor enhancer, but really it's more important with chocolate cake than vanilla. i just think it sounded more fun to add it. pour into lined cupcake tins and bake just like you would regular cupcakes! place 8 oz of chopped white chocolate in a bowl. in a small saucepan, boil 2/3 cup heavy whipping cream. pour the boiling cream over the chocolate and stir until it's melted and smooth. add 2 tbsp butter and stir. 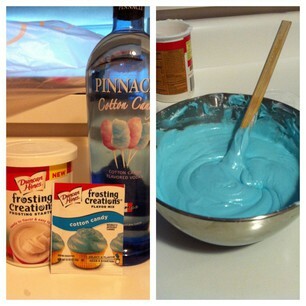 stir in 2 tsp cotton candy vodka. (i was a bit heavy handed with this step. it may have been more like 4 tsp. as long as it thickens, you're good to go!) 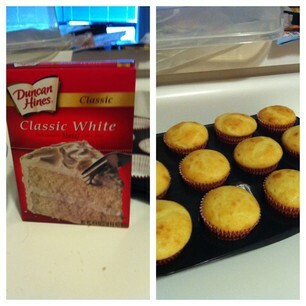 refrigerate to thicken while the cupcakes bake and cool completely. 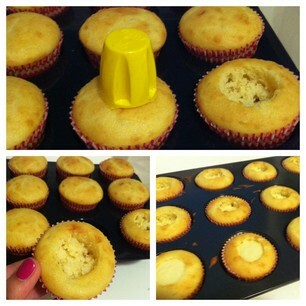 make sure you're working with cooled cupcakes for this step. it's just easier! remove the centers of the cakes. professional bakers use real tools for this step (actually you can buy a cupcake center remover at target) or you can use the fatter end of a frosting design tip. or you can be a real cheapskate like me, and use the cap off a bottle of ez squeeze cheese (um it's the best thing i've found, i kid you not.) the cakes are getting filled and frosted, so these holes dont need to be perfect! just an indent about quarter sized, and half an inch deep or less. just don't go all the way to the bottom of the cake, it'll be a mess to eat! fill the holes with the ganache using a small spoon, up to the top of the cake. i found this little gem at target. usually, i make my own frosting but again, when i'm doing all the other work of adding a filling and alcohol, it's easier to just use the premade stuff. it's just plain frosting, and target sells these little packets to make different flavors (also available - bubble gum, mocha, caramel, mint chocolate... and about 10 others). 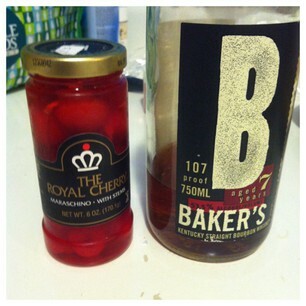 i bought some maraschino cherries in the jar, poured out the liquid, and poured in the bourbon. you can leave this mix sitting in your fridge for quite a while - i'm talking months - with any sort of alcohol you choose. i just love bourbon ... surprise! i left it a couple of days, to get a good flavor. 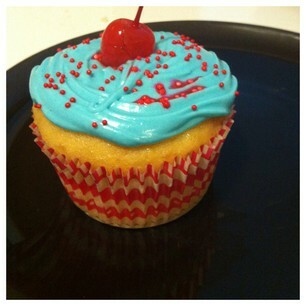 top with red sprinkles, a cherry, and enjoy! responsibly. i'm supposed to say that right? p.s. you can make just about any alcohol infused cupcakes using these basic guidelines. mimosa, margarita, cosmo... it's fun to experiment! have a fun and safe holiday, friends! Winning. You are hilarious and these look and sound delicious! Thanks for sharing!! You had me at "cupcakes." Delish. Those are gorgeous. Great pairings! I made some Chocolate Guinness Cupcakes with Irish Cream Cheese Frosting for St. Patrick's Day... we could probably be friends! Oh yum! Trying this recipe ASAP! They sound amazing. And I love that you used a box cake mix. I do the same when I make Corona and lime cupcakes! Those sound amazing!!! I need to make them for the fourth! Amazing! How did they taste? OH my this seems like the best idea ever! Are they yummy? These sound amazing!!! I LOVE bourbon cherries...we usually have a jar in our pantry at all times. I so have to try these!! What could be better than an alcohol dessert?! Thanks for sharing! This is the most amazing thing I have seen in a while. Booze and sweets=happiness!! Thanks so much for sharing. I need to try this. Ahhhhh!! Why didn't I see this earlier this week??!! Love it! You are so after my heart sneaking booze into your cupcakes. :) Very happy to have you for the Unique Sweets Dessert Challenge. Good luck! Holy Smokes...Yum oh Yum give me some! These are cute and clever! 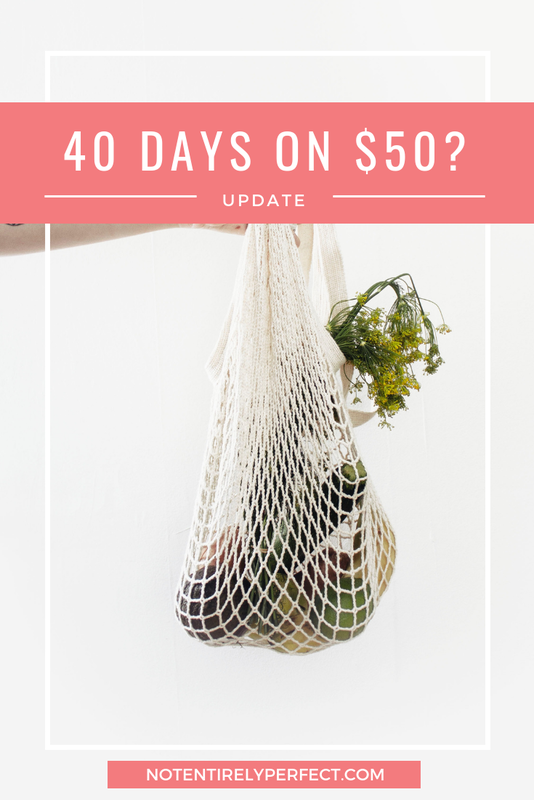 I consider my fridge empty if there is not a bottle of cherry bourbon balls in it!